We had to list this multi-multi hand of video poker game separately. This is for the big gamblers among us. If you really want to win big you should try this game. Only offered at a few casinos but what a rush if you win big at your first hand......your winning combination will show at all your ten hands. The essence of multi-hand video poker is explained in the picture above. At first draw we were dealt two pairs. Of course we decided to hold those four cards. Automatically the cards are copied to the other hands. The next draw every hand is dealt another card from a different deck. This means that a full house is possible at every hand. At Rushmore Casino video poker is available in several variations. 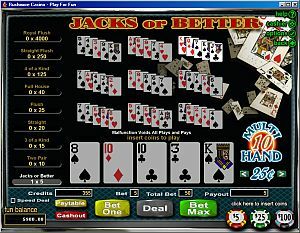 They offer: Jacks or Better, Aces & Faces, 10s or Better, Joker Poker, Deuces and Joker, Deuces Wild and Double Joker. 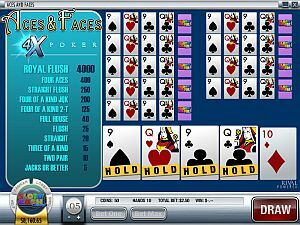 All games are available in 1, 4, 10 or 25 hands. Rushmore Casino even offers up to 100 Hand video poker. At Rushmore Casino you find a large number of video poker specialties. Wild Card Video Poker variations, Bonus Poker variations, Specialty Video Poker, and of course all the classic poker games. Most games area available in 1,3,10,52 or 100 hands.